The first murder conviction read by Arapahoe County Judge Carlos Samour Thursday evoked a whimper and several tissue-muffled sobs. 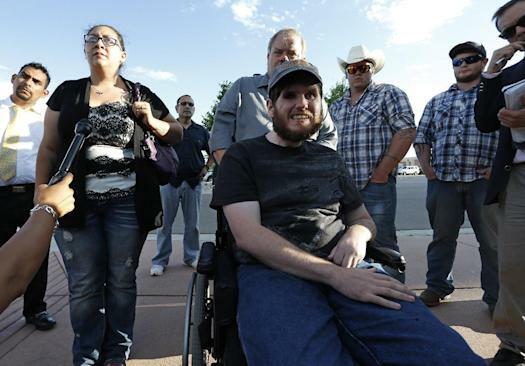 Those sitting on the packed right side of Courtroom 201 — either survivors of the July 20, 2012, Colorado movie theater shooting rampage or loved ones of those killed — tried to heed the judge’s request to keep their emotions in check, but this day was a long time in the making. “As soon as you heard the first guilty, we knew all the dominoes were about to fall,” said Tom Sullivan, whose son Alex was slain. “Yes, yes,” mouthed a tearful Sandy Phillips when it was confirmed that Holmes was guilty of murdering her 24-year-old daughter, Jessica Ghawi. Joshua Nowlan, his walking cane hanging on his courtroom seat, brandished a smile and nodded in agreement that Holmes was guilty of attempted murder for shooting him in the leg. The jury of nine women and three men rejected defense arguments that the defendant was insane and driven by delusions during the attack that killed 12 moviegoers and wounded 70 others. After 11 weeks of often disturbing testimony, the jury convicted Holmes on all 165 criminal charges. Jurors reached their verdict after deliberating for about 12 hours over a day and a half. At least one juror — who told the court she was a crime victim in her youth and that mental illness affects all people in different ways — was shedding tears when the panel entered the courtroom. Other jurors seemed impassive as their findings were read. The jury foreman, selected by his peers, appeared to watch Holmes during the entire proceeding. 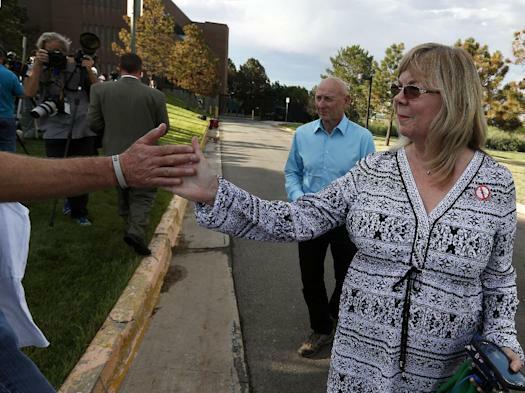 Jury selection early this year revealed that the foreman attended Columbine High School during the 1999 school shooting there and had gone to prom with one of the 13 victims. The jury will return Wednesday — three years to the day that Holmes first appeared in court with wild orange hair — to begin hearing evidence and testimony in a penalty phase. Under Colorado law, if just one juror disagrees with a death sentence, Holmes will be sent to prison for life without parole. After the hearing, dozens of the shooting victims and families of the slain congregated in the courthouse parking lot. Some celebrated, others cried — finding relief after their toil for justice. Holmes, 27, was charged with two separate counts for each murder and attempted murder. Dressed in a blue button-down and khaki slacks, Holmes stood still at the defense table as the judge read through each guilty count. He stared straight ahead and never removed his hands from his pockets. His parents, Robert and Arlene Holmes, sat on the left side of the courtroom about 15 feet behind the defense table. Arlene Holmes removed her glasses several times to wipe away tears. Defense attorneys argued that Holmes was in the clutches of a psychotic episode and didn’t know right from wrong when he ambushed the sold-out theater. Four psychiatrists who interviewed Holmes had agreed that he suffers from mental illness, but were split during the trial on whether he met the criteria to be declared insane at the time of the shooting. Prosecutors painted a pictured of a conniving egomaniac who killed for enjoyment. The case has drawn international attention and stoked fiery debate about the death penalty, gun control and the execution of people who are mentally ill. A rampage killer going to trial has also boosted interest, as it offers a rare look inside the mind of a mass murderer. Most mass killers commit suicide or are killed by police at the scene. Prosecutors rejected a plea offer to a life sentence without parole in 2013. “Justice is death,” District Attorney George Brauchler said at the time. The tragedy at the Denver-area theater is among the worst mass shootings in U.S. history. Holmes was armed with three guns and more than 700 rounds of ammunition. Police said the bloodshed would have been worse, but the gunman’s semi-automatic assault rifle jammed during the attack. “He only stopped when the gun stopped,” Brauchler told the jury during closing arguments. The dead ranged in age from a 6-year-old kindergartner to a 51-year-old father of four. Fifty-eight moviegoers were wounded by gunfire, and 12 more suffered other injuries in the commotion to escape the theater. Those killed include Jon Blunk, 26; Alexander Boik, 18; Jesse Childress, 29; Gordon Cowden, 51; Jessica Ghawi, 24; John Larimer, 27; Matt McQuinn, 27; Micayla Medek, 23, Veronica Moser-Sullivan, 6; Alex Sullivan, 27; Alex Teves, 24; and Rebecca Wingo, 32. Some of the wounded suffered life-changing injuries including brain damage and paralysis. It took more than two years for the case to reach jury selection. Officials have said the number of victims, amount of evidence and legal issues surrounding the death penalty and Holmes’ insanity plea contributed to the delay. The process to pick 12 jurors and 12 alternates from a pool of 9,000 candidates took more than two months. In February, records obtained by Yahoo News revealed the cost of the case had already exceeded $5 million three months before opening statements were made. During the trial, jurors heard from nearly 300 witnesses, were shown more than 1,500 photos — including unsettling images of the grisly crime scene — and viewed 24 hours of video. Much of the video was interviews Holmes has done with psychiatrists since the massacre. The four psychiatrists who evaluated Holmes agreed that he suffers from schizophrenia spectrum disorder. Two court-appointed psychiatrists concluded that he was sane at the time of the shooting, but the two working for the defense believed he was legally insane. Holmes surrendered to police without incident near his car behind the theater after the shooting, but prosecutors said he may have wanted to flee. Evidence recovered from his two-door hatchback included devices used to throw on the road and puncture the tires of pursuing vehicles, cash, backpacks, a first aid kit, a canister of tear gas and a .40-caliber handgun. He also left his apartment booby-trapped with homemade bombs that had to be defused by authorities. Prosecutors said Holmes meticulously planned the massacre for months in response to a series of personal failures, including losing his first-ever girlfriend and dropping out of graduate school. “On July 20, 2012, he tried to murder a theater full of people because he thought it would make him feel better and increase his self-worth,” Brauchler said when the trial started April 27. The defense team never contested that Holmes spent three months purchasing guns and explosives and charting the attack. King, the lead court-appointed defense attorney, said Holmes began suffering from serious delusions in March 2012 that intensified when he was misdiagnosed and given anti-anxiety medication in May 2012. “We can’t attribute logic to it, that’s why it’s psychotic,” King told the jury. While describing “human capital” to one of his court-appointed psychiatrists, King said Holmes told the doctor that members of the jury or his executioner would likely get rewarded if he were to receive the death penalty. On Thursday afternoon, Holmes turned his head and watched intently as each juror exited the courtroom.